Our original musicians and bands showcase featured a variety of artists whose sites run on WordPress. Whilst I thought that the mix was suitably eclectic, after a lot more digging, I have found ten more websites that are truly unique in their differing approaches to design. The list below covers everything from quintessential blog designs, to more intricate layouts that are about as far away from “typical WordPress” as one could imagine. One clear conclusion can be made from the offerings below – WordPress offers little in the way of resistance to truly creative design approaches. Mac Miller (or Malcolm McCormick, as his parents would call him) is a rapper hailing from Pittsburgh, Pennsylvania. At just 20 years of age, he already has a number one album to his name. As for his site, it is a fairly standard (albeit jazzed up) header/sidebar/content layout. The color scheme is rather dark, but thankfully does not resort to light text on dark backgrounds (which in my opinion is the cardinal sin of web design). You may not of heard of Sigur Rós, but it is fair to say that their website’s design perfectly matches their rather ethereal sound. Their’s is a minimalistic and content-driven blog, complete with tags, a Flickr stream, and a YouTube stream. That’s right folks – your eyes do not deceive you. This is the website of The SEO Rapper – a man who isn’t afraid to keep it real with his internet marketing tips. Brilliant. As for the site, it is a fairly typical blog design as with the other two sites we have covered so far. But to be quite frank, with all the videos to check out, who’s looking at the design? Now it’s time to move onto something a little more flash (but thankfully, not actually Flash). Rodney “Dark Child” Jerkins is a seriously accomplished musician and record producer, having worked with everyone from Michael Jackson to the Spice Girls. Much like Mac Miller’s site, this is a rather dark affair, and it does in fact use light text on a dark background. However, the graphical presentation of the site is pretty impressive, so I’ll let it slide. Apparently, Ashleigh Mannix has “a boundless sound that floats somewhere in the realms of folk, rockabilly and blues fusion”. She also has a really nice website. There’s nothing particularly overwhelming about it, but it matches her sound perfectly, with a subtle blend of pastels and creams. Some of you may be more familiar with Big Boi as one half of Outkast, but he is of course an independent artist in his own right. As with Dark Child, his site is a graphical experience layered on top of a fairly normal blog design. It serves as a good example of how you can make something typical quite unique with the application of some graphical elements. This design is somewhat unusual in that the sole navigation element is placed to the top left of the screen. Beyond that, it is a single column layout with a static background. The monochrome effect is a nice touch. Morcheeba are a prolific electronic band hailing from London, England. I really like their site’s design, with its contrasting focus on greens and reds, with no room for white space (which is something I’m not typically keen on). There seems to be a common trend amongst musicians in that their sites are heavily graphic-laden, which is of no great surprise, given that the face of the band typically best represents their brand. This is no exception with Lights (incidentally, that is actually her name), a Canadian electropop performer. Like Chris Shiflett’s design, it is characterized by a static background, whilst the boxy layout separates the distinct elements of the site – namely news, video, Twitter and a photo stream. 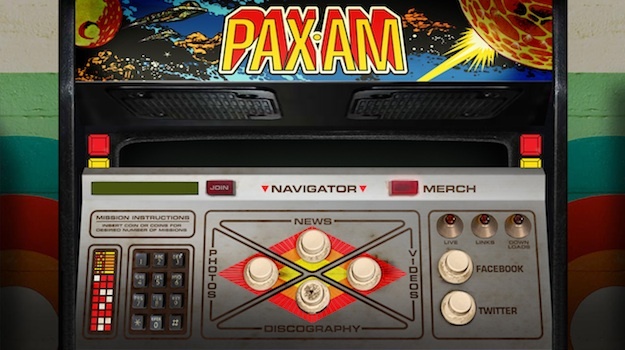 Speaking of graphic-laden, no design in this list is more overt than that of Ryan Adams’ Pax Americana record label. As you can see from the above screenshot (although you really should check out the site to experience its full glory), the design is set to replicate an 80s arcade machine. All of this in a WordPress site. Who would’ve thought it? It’s great to see more and more sites are using WordPress, it’s an amazing tool for blogs but can be used for pretty much anything which is why I love it. The majority of my personal and client sites are built of WordPress. Thanks for the collection.